“Var. latiusculum, Eastern Bracken: Mainly in dry woodlands, forests, and heath balds, up to 1600 m in elevation. Common in NC Mountains and Piedmont, rare in Coastal Plain. Var. pseudocaudatum, Southern Bracken: Mainly in dry sandy woodlands, often locally abundant in sandhills and flatwoods. Var. 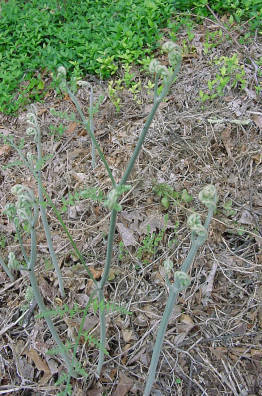 pseudocaudatum is primarily distributed in the Southeastern Coastal Plain (where it is ubiquitous and abundant) = Pteridium aquilinum” (Weakley 2015). Uncommon in NC Mountains and Piedmont, common in Coastal Plain. "Pteridium is a notorious and nearly worldwide weed (though less consequential in our area than in many parts of the world), nearly impossible to eradicate because of its deeply subterranean rhizomes. Bracken fiddleheads are sometimes eaten, but they are poisonous and highly carcinogenic. 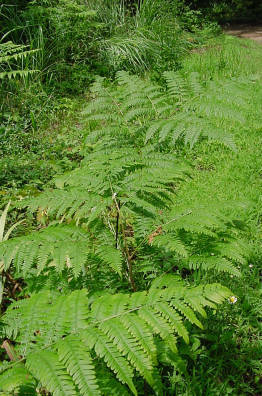 Bracken is not favored by grazing animals, and increases its abundance under grazing pressure. In overgrazed pastures, however, cattle will graze on bracken, the carcinogenic compound (shikimic acid) then transmittable to humans through milk" (Weakley 2015).